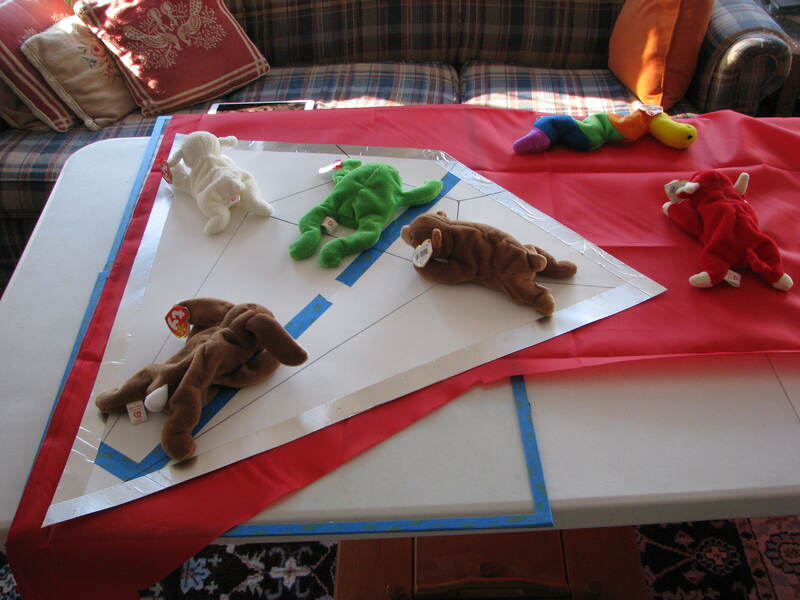 You are currently browsing the category archive for the ‘Kite Making’ category. It’s been a week since hurricane Florence blew through our area. The devastation is horrible. So many people have lost everything they own. So many people have no home to come back to after evacuating. We stayed through it all and are very glad we did. It minimized our damage to just a couple of ceilings and shingles lost. After spending the week cleaning and removing debris, I was looking forward to a community kite fly as a means to get away from it all. Unfortunately, Fort Macon State Park is closed. For how long, we have no idea. They are doing damage assessment and repair and have to see how much beach remains after the storm. Being on the “right” side of the a very slow-moving storm results in a lot of beach erosion. Some areas now have a four-foot drop to get to the beach. Some have lost the beach and the first row of dunes. And, oddly enough, some areas show no erosion at all. The quirks of a hurricane. 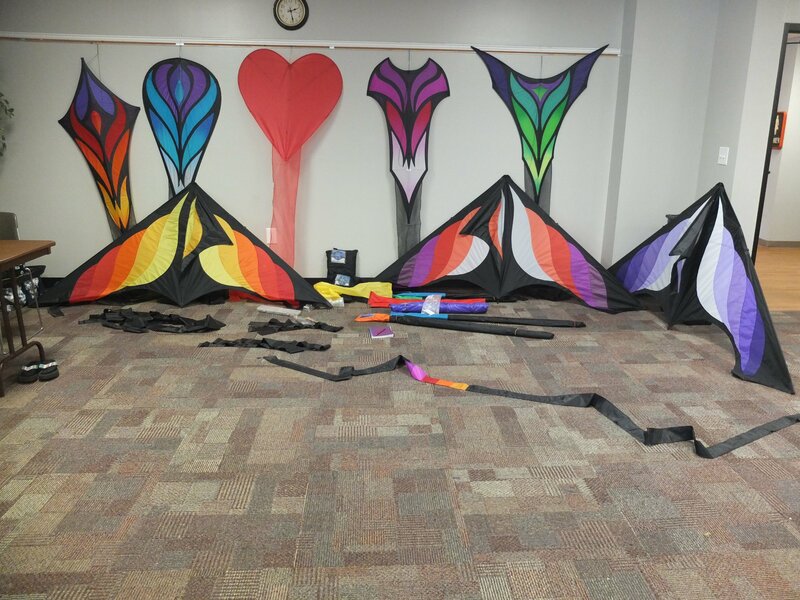 So it may be a while until there will be another community kite fly. We hope not. So I’ll take us back to a more pleasant time. To a kite building workshop which was held this past July. 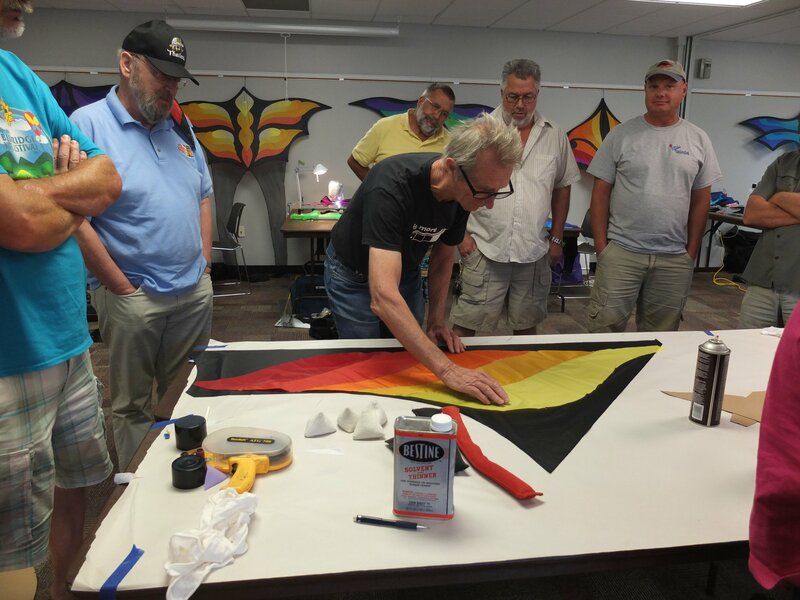 A couple of NC kitebuilders decided at the beginning of the year that it would be nice to have Robert Brasington hold a kite building workshop in NC. One was held four years ago in Raleigh, NC and it was about time for a return visit. 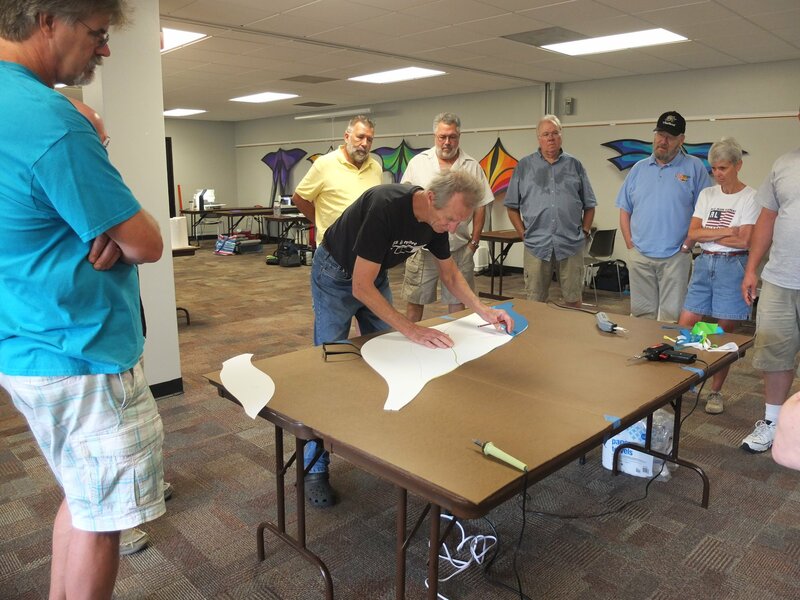 A number of builders from NC, SC and VA were definitely interested so the planning began. The location this time was Morehead City, NC by popular demand. Conveniently located so the builders and spouses and families (should they decide to tag along) could spend some time at the beach. Thirteen builders converged, ranging in experience from complete novices to master builders. 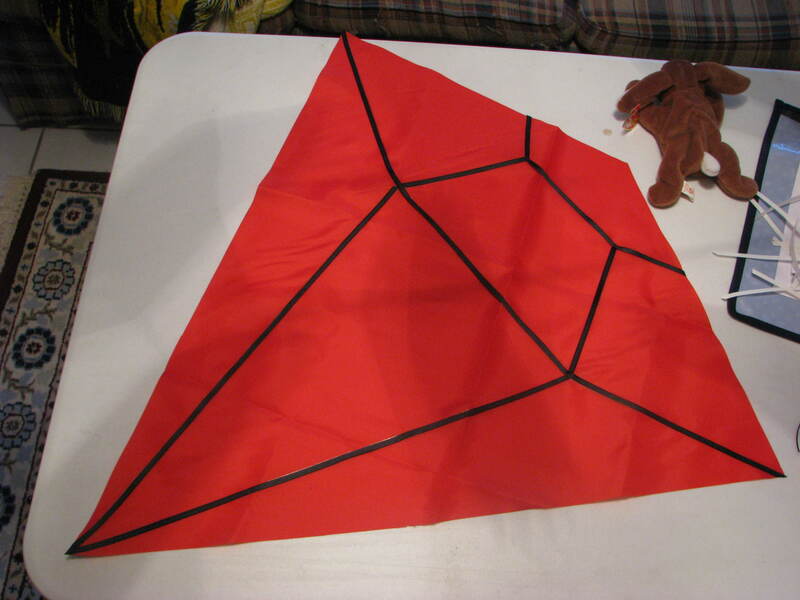 The majority chose to build the 3/4 stealth delta kite in varying colors. The delta was my choice as I had never made a delta before and I truly admired the Brasington deltas. His technique of using adhesive and multiple templates is very different from what I normally do so this workshop was a learning experience. But that is why I like to attend workshops. 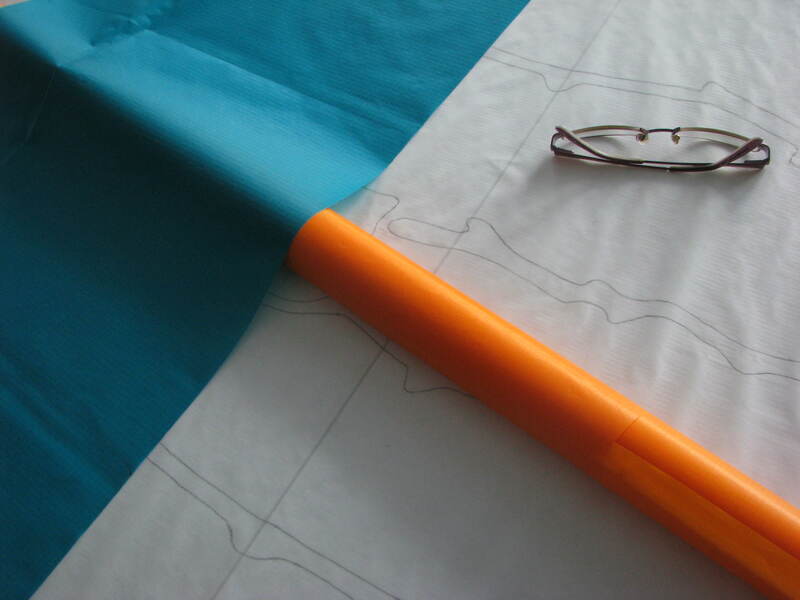 I’m always open to new ways and, sometimes, easier ways to build a kite. The camaraderie during the weekend was grand. Taking breaks from sewing to visit with people I only see once or twice a year was one of the best parts. 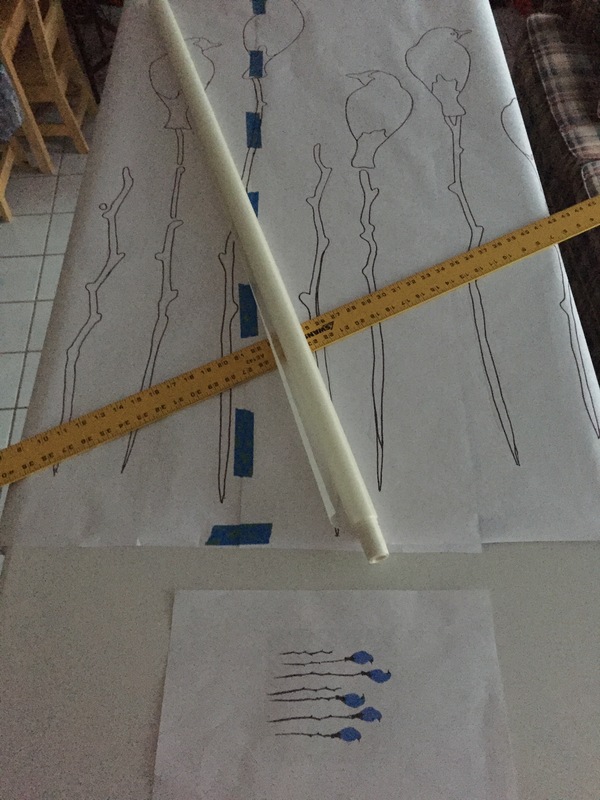 Having to hem three incredibly long tails for the delta was the worst. 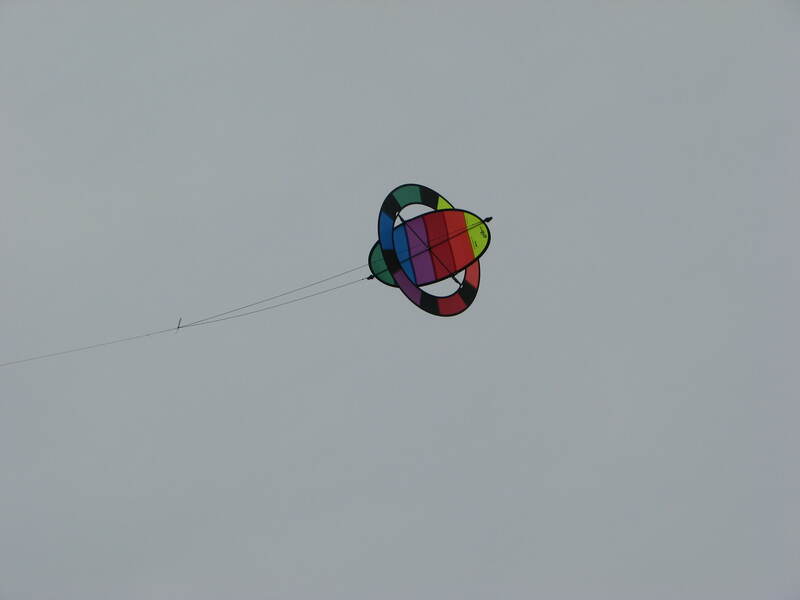 Unfortunately, some people had to leave early on Sunday and others were in a rush to go to the beach and fly their new creations. So we missed getting a group photo. All in all, it was a great weekend and one which many of us are looking forward to doing again. 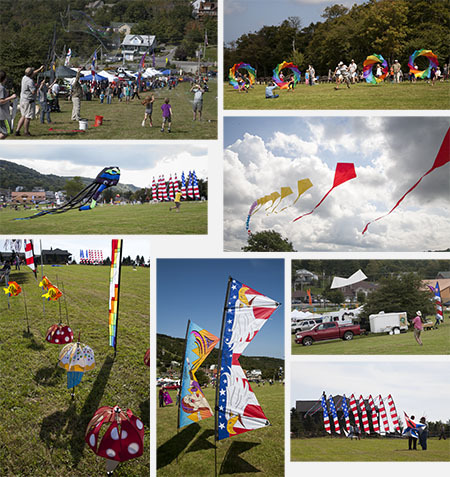 We spent the Labor Day weekend at the Mile High Kite and Craft Festival in Beech Mountain, NC. This tiny town of about 350 people has hosted this festival for the past twelve years. We’ve attended the last six. 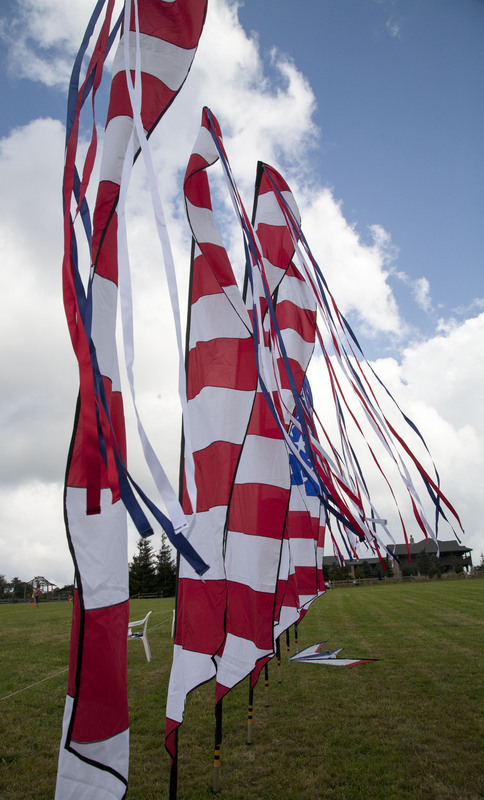 It is a gathering of kite people from several neighboring states and kite clubs. The weather hasn’t always cooperated but the fellowship has been good regardless. This year it didn’t rain. Yeah!!!!! But the wind didn’t attend either. 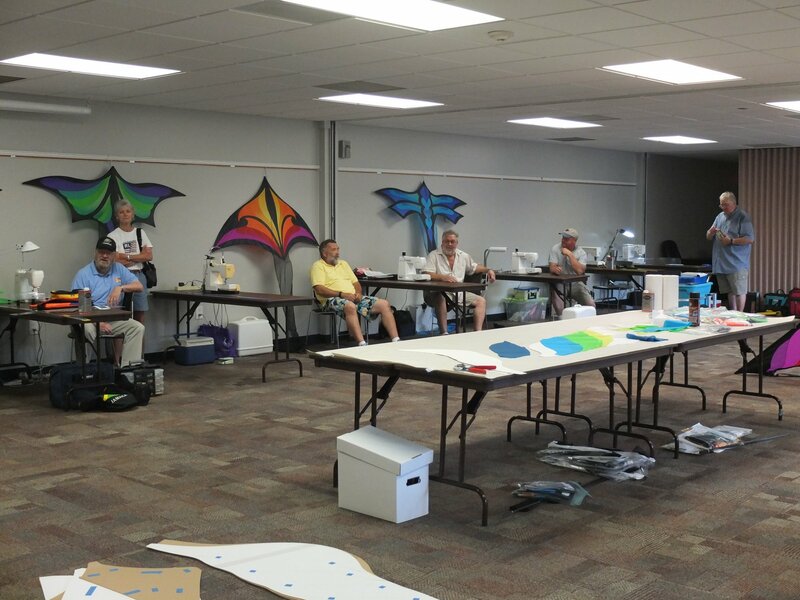 Saturday was an open fly and a kite builders competition. 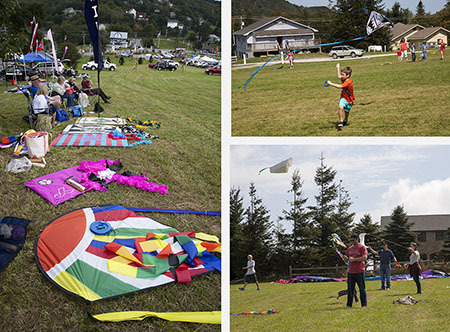 The chamber of commerce was giving away small sled kites to the children attending the festival. After decorating the kites, there were a lot of kids and adults running up and down the side of the mountain getting their kites to fly. 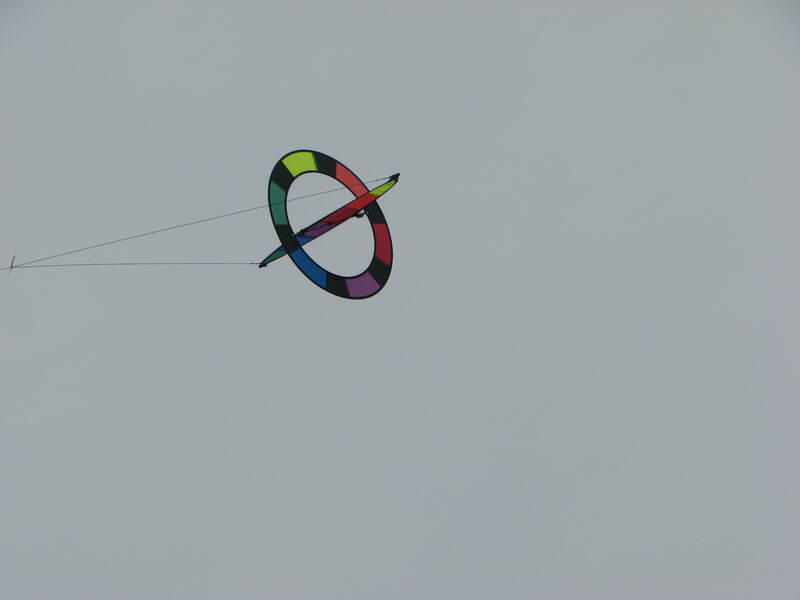 There were a wide range of kites brought from home or purchased at the vendors’ booths. 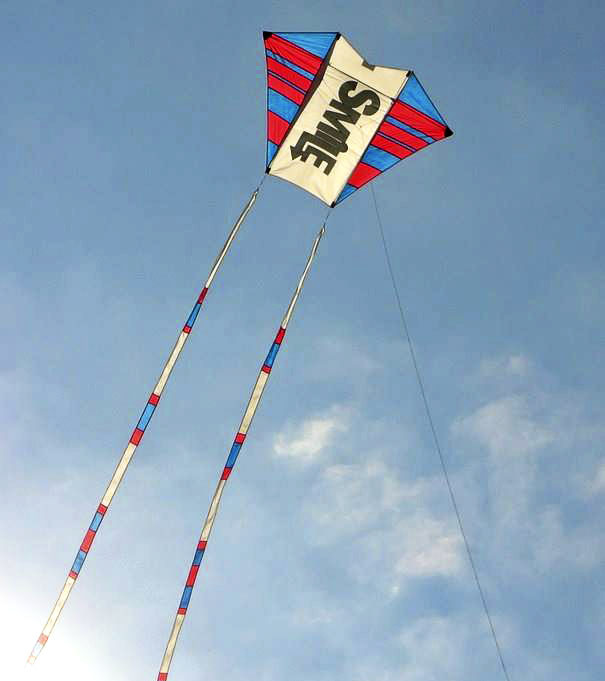 Whether the kites would fly or not, there were still a lot of smiles all day. Sunday was the official festival day. The sound system was set up, banners and ground displays lined the demo field, and the flyers were ready to put on a show. But, again, the wind decided not to show up. All the kite fliers pulled out their light wind kites and tried to get things up in the air. And, again, kids and families were running up and down the mountainside with all manner of kites. Some flew for a bit and some were just dragged along the ground. Yet, there were still smiles on faces all day. During the dead calm times, there were boll races for young and old and giant soap bubbles floating across the field. There were three remarkable demos performed on Sunday. One was a ballet using a white indoor Rev, another was a pairs stunt kite ballet and the third was a ballet using a standard Rev (the flier spent a lot of time walking backwards). Amazing feats in little to no wind. One enterprising young man ran up and down the mountain pulling his giant octopus behind him. It should be noted he only did it once. 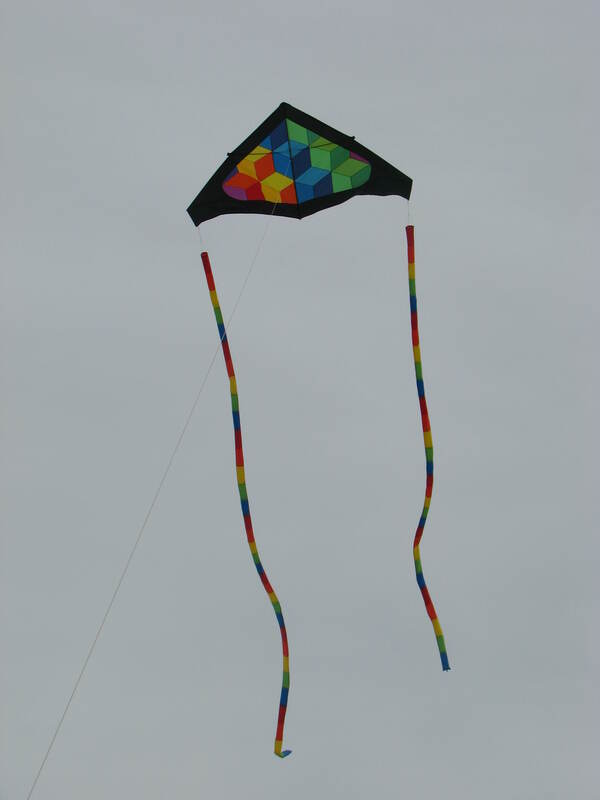 I did fly my Dunton-Taylor box and my sport kite, Wisp II, a few times. The Skate wouldn’t go up and we didn’t think to pull out the Laima. In between flying attempts, we visited with old friends and met new ones. From our point of view, it was a great weekend. We’re looking forward to next year on Beech Mountain.